The Clean-up Challenge 2014 is Save the Beach’s Annual Cleanup Event. 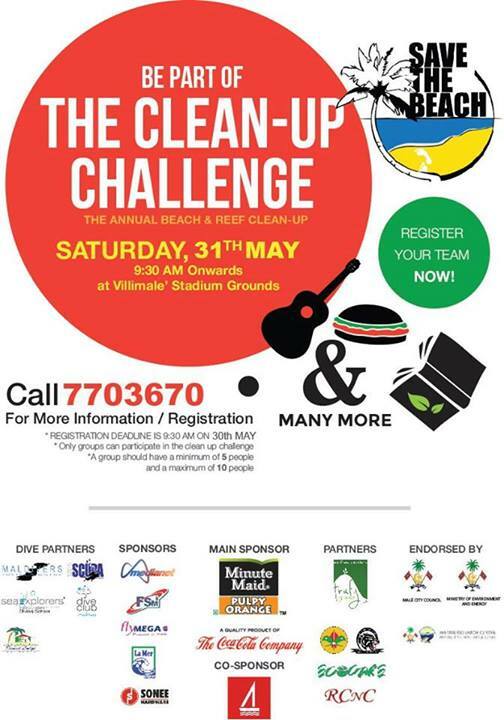 This year it is hosted as a challenge to include more members of the public in the clean-up and it will be held at the Villimale’ Stadium Grounds on Saturday 31 May 2014. Once the cleanup is complete, there will be several sessions by different people involved in environmental and related work to raise awareness on different pressing environmental issues. There will also be stalls from the university and colleges to provide information of different education opportunities related to the field of environment. It is planned as a day event, starting from 8.00 am onwards till 4.30 pm. Registration/group check-ins will be until 9.30 and then cleanup will continue until the afternoon prayer. There will be awareness sessions until 4 O clock when the closing and awarding ceremony will begin. There will also be canteens and food stalls on the grounds where lunch and snacks can be purchased at a reasonable price. Reef cleanup will also be done, however, not as a challenge. To participate in the reef cleanup you must be a certified diver, and remember to bring your card to register at the dive desk.